"Russian Class" is a chidren domra-players ensemble. Despite the young age of the musicians "Russian Class" is the prize-winner at the Regional, All-Russia and International Competitions. The musicians play different types of an old string instrument - domra. A chief of Folk Orchestra "Russian Class" is Galina Ohm. The participants of "Russian Class" are children at age of 8-18 years. 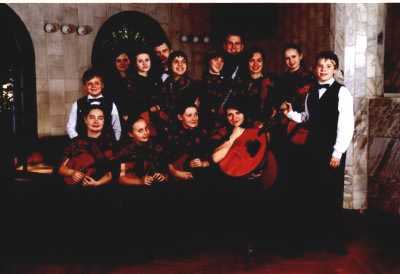 The ensemble is based upon the Russian Folk Art School. At this school the pupils get musical education together with secondary one. Children are taught to play Russian folk musical instruments and piano, they study the theory and history of music, basically choreography and acting, special attention is paid to the English language. "Russian Class" gives quite a lot of concerts and has given several shows at the Regional TV. A. Khachaturyan "Funny Aunties Quarrel"